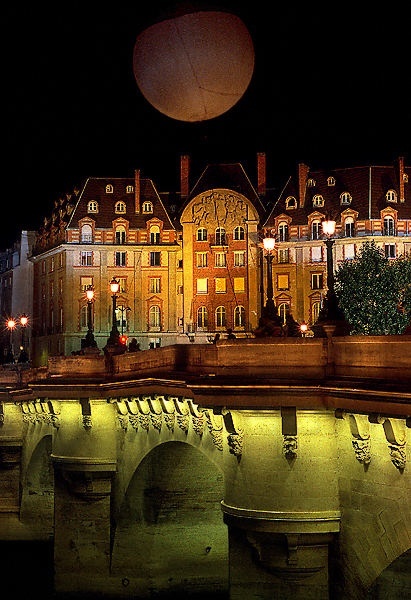 The Pont Neuf is, despite its name, the oldest standing bridge across the river Seine in Paris, France. Its name, which was given to distinguish it from older bridges that were lined on both sides with houses, has remained. It stands by the western point of the Île de la Cité, the island in the middle of the river that was the heart of medieval Paris. The bridge is composed of two separate spans, one of five arches joining the left bank to the Île de la Cité, another of seven joining the island to the right bank. Old engraved maps of Paris show how, when the bridge was built, it just grazed the downstream tip of the Île de la Cité; since then, the natural sandbar building of a mid-river island, aided by stone-faced embankments called quais, has extended the island. Today the tip of the island is the location of the Square du Vert-Galant, a park named in honour of Henry IV, nicknamed the "Green Gallant".